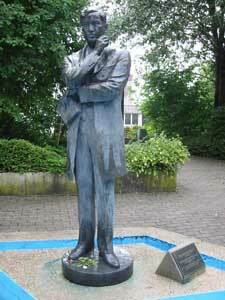 Jose Rizal statue in Wilhelmsfeld, Germany. Wikimedia has received an e-mail confirming that the copyright holder has approved publication under the terms mentioned on this page. This correspondence has been reviewed by an OTRS member and stored in our permission archive. The correspondence is available to trusted volunteers as ticket #2006112310013385. This work has been released into the public domain by its author, Isabel Ritter-Goehringer. This applies worldwide. Isabel Ritter-Goehringer grants anyone the right to use this work for any purpose, without any conditions, unless such conditions are required by law.